This is the dish I associate most with being in France. 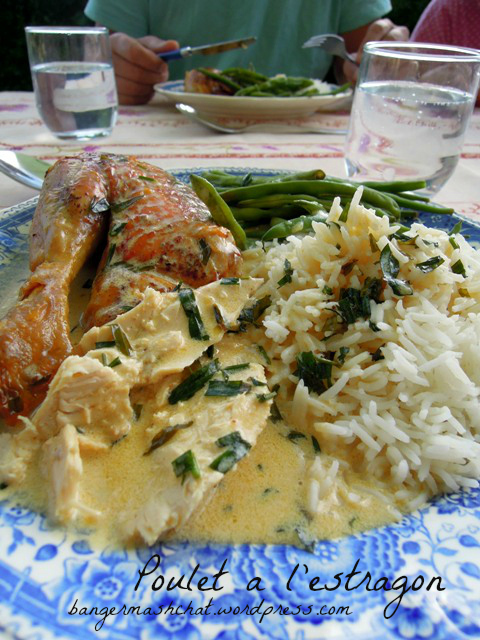 I first ate poulet a l’estragon cooked by my father-in-law when we stayed with them in France some years ago. Thinking about it, it must have been more than 15 years ago, but let’s not dwell on that as it makes me feel rather old. When I ate it, I truly thought I’d died and gone to heaven. It is based on an Elizabeth David recipe and, even though those were the days when I really didn’t spend much time cooking or thinking about food, I had to copy down the recipe at once and I have made it myself many times in the intervening years. It’s such a beautiful dish with only a handful of ingredients, but those ingredients are rather on the rich and decadent side. Perhaps not a dish you should be contemplating if you’re watching the old calories. It’s essentially a simple pot roast chicken but the addition of tarragon, butter and cream elevate it to something quite extraordinarily delicious. 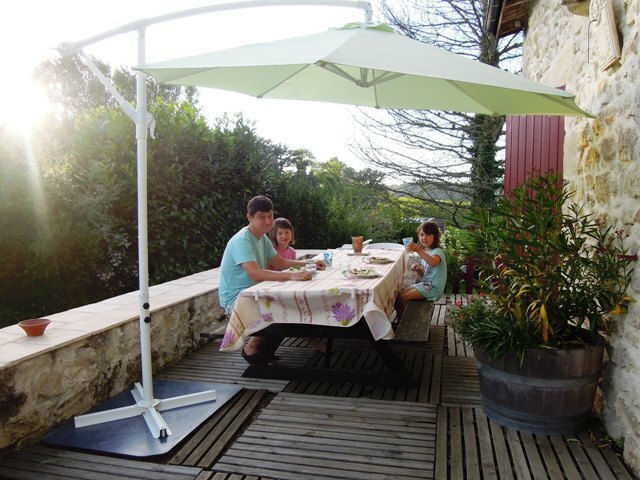 We’ve been on holiday in the Dordogne for just over a week now, far away from the hustle and bustle of our everyday lives. It’s a proper chance to kick back, unwind and spend some quality time with the family. 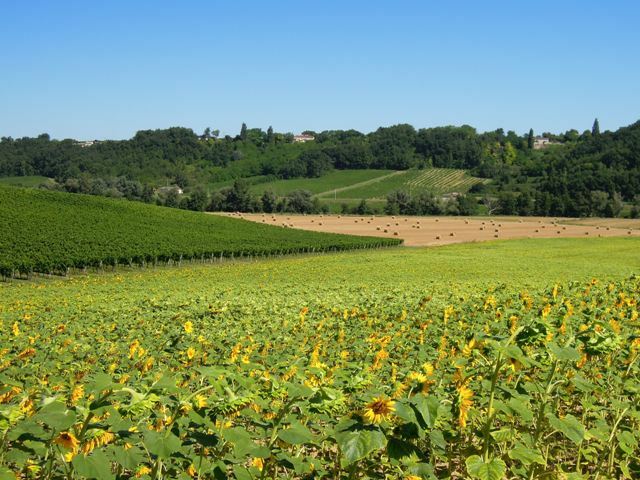 We’re in a stunning location out in the middle of nowhere, surrounded by vineyards and sunflowers as far as the eye can see. Most of our days are spent in the swimming pool, playing Uno, pétanque, consequences or table football, devising treasure hunts and walking in the nearby woods. Oh, and of course cooking and eating. Yes, there’s been quite a bit of cooking and eating. Oh and lots of mini bottles of ice cold beer too. One of our first meals here had to be poulet a l’estragon. I made it for the first time without following the notes I made all those years ago on my now tatty and grease-spattered scrap of paper, and was rather pleased with myself for remembering what to do. But then it is pretty easy. And it tasted all the better for being eaten outside as the sun was starting to set after an arduous day soaking up the French sunshine. Take two-thirds of the butter and using a fork gently mash in around half of the chopped tarragon, and give it a good seasoning with salt and pepper. Stuff most of this inside the chicken and rub the rest onto the skin on the breasts and legs. Place the chicken on its side in a large ovenproof casserole and cover with the lid. Roast in the oven for about an hour and a half, turning onto the other side half way through and basting with the herby, buttery juices. The aroma at this stage will be quite incredible and I defy your stomach not to start growling. When the chicken is tender and the juices run clear, remove from the oven, and keep warm on the carving board while you make the sauce. Work the flour into the remaining butter and, over a low heat, stir this into the juices in the casserole, along with the rest of the chopped tarragon. Then stir in the cream and bring to a very gentle simmer. 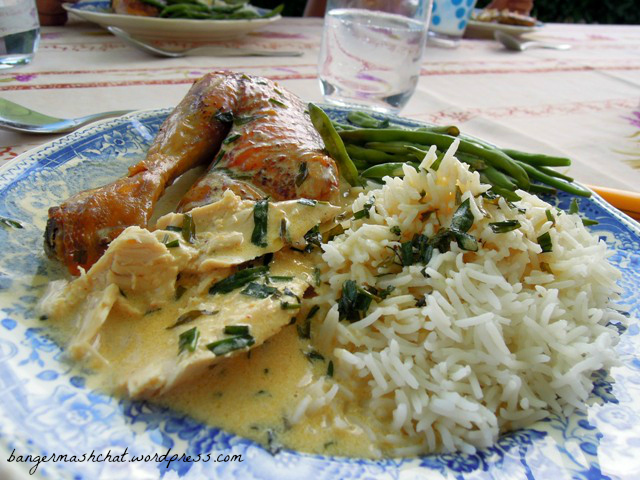 Carve the chicken and pour over the tarragon sauce. I like to serve with steamed rice and a vegetable such as green beans. French beans, naturellement. Bon appetit! As the star of this dish is undoubtedly the tarragon, I’m entering it into August’s Cooking with Herbs challenge, hosted by the wonderful Karen at Lavender & Lovage, who I’ve just discovered is only ‘just down the road’ here in France! Thanks Elena! The skin is good and crispy as the chicken is cooked on its side and turned midway. I haven’t tried slow cooking this dish but I think it would work, although you might not get the same result with the skin and want to remove that before serving. One way to reduce a few calories perhaps?! Mm, definitely no crispy skin in the slow cooker but I agree it would most probably be delish. For me it’s just a matter of avoiding a hot oven (temps still mid 30ies here)! Thanks for your reply! That looks totally amazing Vanesther, and it’s made me hungry! I want to eat that NOW.